I know it goes without saying but dammit I do hate goodbyes. The past 12 hours has already been filled with a couple of teary embraces and I’m just getting started. I hated them back when Mike & I were doing the long distance thing and I hate them now with my family. With the amount of times I’ve had to say goodbye to a loved one without knowing when I’d see them again – you’d think I’d be a pro by now. But nope. If anything I think it gets harder every time because I know the inevitable is coming and I’m about to feel all the feels. Try as I might to swallow back that lump in my throat letting me know what’s coming – it wins every time. Boo. At least this time I’ve got Mike by my side to provide a little comfort and a little distraction on the way back to England. This was the first time Mike’s been able to travel with me to Arizona since we’ve been married and for that I’m so grateful. But for now, I’ve got another 6 hours until we’ve got to be dropped off at the airport and I don’t really want to think about goodbyes. In the mean time I’m going to just sit with my favorite dog, drink some coffee and wait for 7am to roll around. I told my little brother, Matthew, that we’d bake some cookies before we leave because (life hack) chocolate chip cookies make everything better. Especially the dough. So let’s get on to the chocolate caramel turtle clusters then, shall we? Say that five times fast. Every time I make these they all disappear within 24 hours. Take that as your sign to make these ASAP because they are that good! I’ve been using this 5 minute vegan caramel sauce for years now and it never disappoints. Five ingredients and five minutes. That’s all you need to make the most addicting caramel sauce ever – vegan or not. A spoonful of this caramel dropped over a cluster of toasted pecans and a drizzle of dark chocolate – pure bliss. I like to go all out and shape actual turtles when making this because it’s cute. If you don’t have time for that I totally get it. 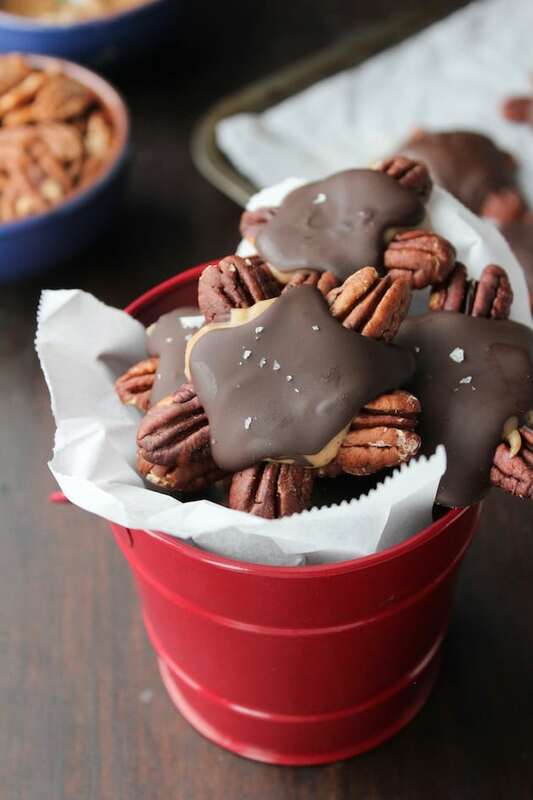 Feel free to drop a couple of pecans on a cooking sheet and just make little clusters instead. It’s just as tasty without the added guilt of biting off the turtles head. And on that note I’m signing off! There are still cookies to be made and tears to fight back. Do me a favor today and give all your loved ones a hug to show them that you appreciate them. 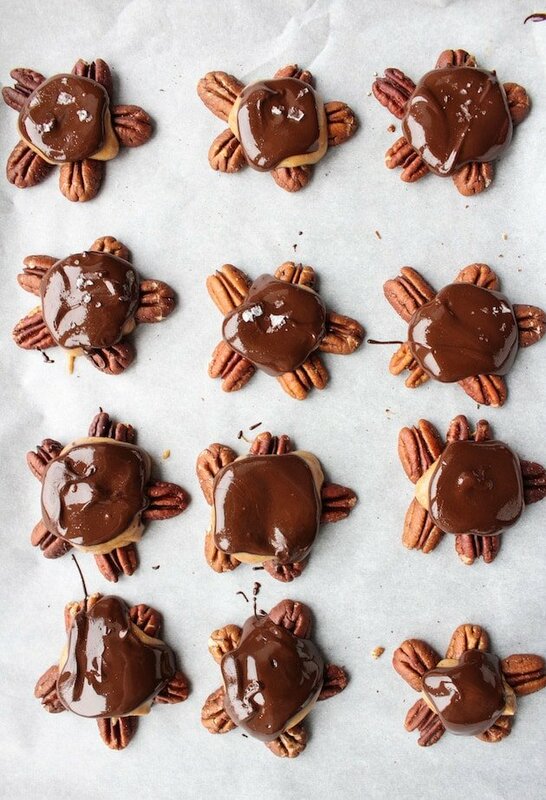 Don’t forget to #asaucykitchen on instagram if you make these vegan chocolate caramel turtles. We love seeing what you make! You can also post your pictures to our facebook page! Add all of the caramel ingredients to a small sauce pan and warm on a low heat. Stir together until the coconut oil and the nut butter melts, then remove from the heat. Keep stirring until everything is smooth and completely mixed together. Place in the fridge to let cool and harden slightly while you prep the other ingredients. Spread the pecan halves across a baking sheet in an even layer and toast in the oven for 5-7 minutes until the pecans become fragrant and slightly browned. Remove the pecans from the oven and let cool. Add about an inch of water to a medium sauce pot and bring to a simmer. Add the chocolate to a heat proof bowl. Make sure the heat proof bowl is large enough that it can sit in the sauce pot without actually sitting the pot or touching the bottom of the pot. Stir the chocolate as it softens over the simmering water. When there are only a few chocolate chunks left unmelted, remove the bowl from the heat. Keep stirring until the chocolate is fully melted. Set aside. 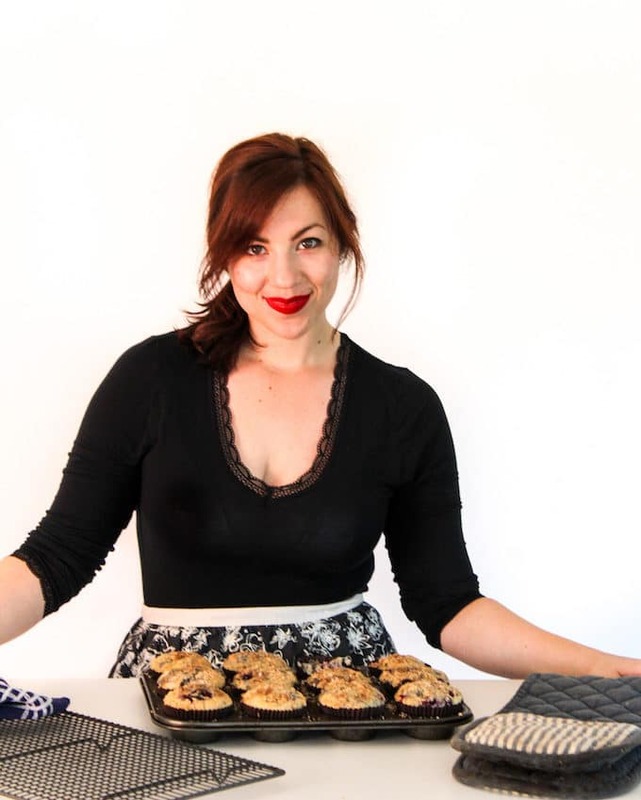 Line a couple of baking sheets with parchment paper and arrange the pecan halves into star shaped clusters of five. You can also just drop the pecans into small clusters without arranging them. They won't look like turtles, but it will be faster and just as delicious in the end. Remove the caramel mixture from the fridge. If the caramel has solidified stir until it becomes easier to work with - the consistency should be like honey or brown rice syrup. Use a small spoon to drop mounds over the pecan clusters. 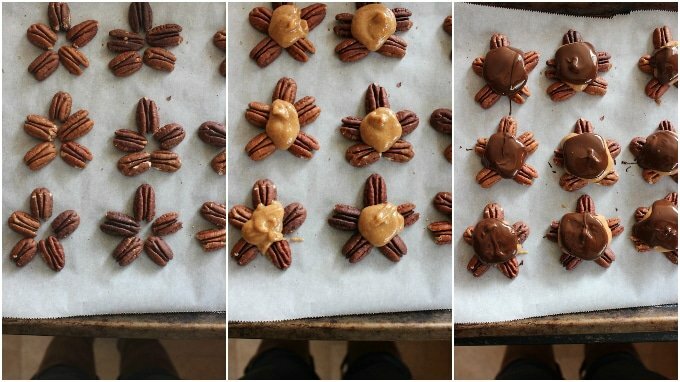 Do this until all of the pecan clusters are covered. Use another small spoon to cover each pecan caramel cluster with the melted dark chocolate chocolate. Once every cluster is covered, place in the refrigerator to let harden for 20 minutes and enjoy. Store these in the refrigerator. Yum!! These are on the to-make list for the Holidays! Thanks Emmy! Hope you like them as much as we all did! I don’t even think these would last 24 hours at my house Sarah!